(The Original) Tick Tock 1969 Owens 28 ft. Growing up, Tim's family enjoyed some great seasons boating on Lake Michigan. The Tick Tock was bought brand new in the mid summer of 1969. 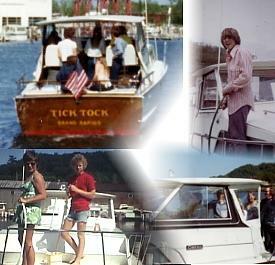 The Tock family made numerous friends from those "boating days" and plenty of fond memories in those short few years. Rafting off in Spring Lake, cruising north on Lake Michigan to places like Pentwater and Leland, and just hanging out at the marina are some of the moments that last a lifetime.